In the aftermath of the American Civil War, southern farms lay in ruins and farmers nationwide experienced hard times as they faced droughts, insects, and rising interest rates. Held hostage by the railroads that linked them to the world, farmers paid too much for transportation, farm equipment, and supplies, and received too little for what they produced. In 1867, the federal government hired Minnesota farmer Oliver Hudson Kelley to study the agricultural conditions of the South. Grangers Picnic, Williams Grove, PA, cirica 1916. Well-received by his Masonic brothers in the former Confederate states, Kelley came up with idea of a Secret Society of Agriculturists that would not only help restore good will between the North and the South but also promote the interests of America's embattled farmers. In 1867, Kelly helped establish the Order of Patrons of Husbandry, better known as the National Grange. The idea took off, and by 1871, Americans farmers had organized eighty-nine local Granges nationwide and two state Granges in Iowa and in Kelley's home state of Minnesota. In Lycoming County, Pennsylvania, farmer Luke Eger had been reading articles about the new cooperative farmer's groups out West. After corresponding with Kelley in Washington, he was determined to organize a grange for himself and his neighbors. At first, there was little interest, but Eger persisted until he persuaded enough folks to join. "I have at last succeeded in organizing and raising a club here," Eger wrote to the National Grange in 1871, "and think there will be little trouble after this in establishing clubs in the county." "Gift for the Grangers," color lithograph, 1873. On March 4, 1871, Eger and thirty-nine supporters began Eagle Grange #1 near the base of Bald Eagle Mountain. One of their first actions was to set up a plan for the cooperative purchasing of supplies to drive down prices-and to boycott merchants who refused to give them the lower rates. 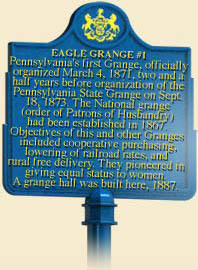 Two and a half years later, on September 18, 1873, representatives from twenty-two state granges met in Blenizer's Hall in Reading to organize the Pennsylvania State Grange. They elected Frank Porter, Eger's brother-in-law and now Master of the Eagle Lodge, as its the first Overseer. One of first initiatives of the Pennsylvania Grange was to set up cooperative buying plans for the group to purchase machinery and supplies at more reasonable prices. "Although it is in its infancy," Worthy Master Mauger of Pottstown boasted in October, 1873, "the power of our organization is being felt all over the country, as no similar organization has ever been. . ." Two years later, Pennsylvania's 440 granges boasted more than 18,000 members. In January 1874, R. H. Thomas of Mechanicsburg began publishing The Farmers Friend and Grange Advocate, a weekly paper that included reliable news to farmers and excluded "quacks and humbuggery" from its advertising columns. Newspapers like these included news about the Grange laws sweeping across the nation in the late nineteenth century, and Pennsylvania was soon included. That summer, Thomas founded the Interstate Exhibition of the Patrons of Husbandry, popularly known as the Grangers' Picnic, held for a week each August at Williams Grove into the 1920s. Over time, Granges throughout the Commonwealth successfully pushed for: creation of the State Board of Agriculture in 1876, the first state agency established to administer the agricultural laws of the Commonwealth; legislation in 1878 that regulated the sale of oleomargarine (better known today as margarine), which was hurting the state dairy industry; and passage in 1879 of the first state law to protect farmers against fraud and misrepresentation in the manufacture and sale of fertilizer. Pennsylvania joined other state granges in a fight for the federal regulation of railroads. This culminated in passage of the Interstate Commerce Act of 1887, which created the Interstate Commerce Commission and began federal regulation of interstate railroads. 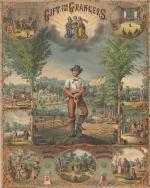 In the decades that followed their formation, Pennsylvania granges tackled numerous state and local agendas: organizing their own stores and banks; campaigning for increased funding of public and agricultural education, and the creation of the State Department of Agriculture,; creating agricultural experimentation stations; conservation of state timber and mineral resources; rural electrification and road improvement; campaigns for eradication of bovine tuberculosis and other livestock diseases. On the national level, the Grange lobbied for Rural Free Delivery, the graduated income tax, direct election of Senators, and women's suffrage. The Grange was the first national organization to offer women full membership, so women from the beginning played an active role in the Grange. By 1918, Grange organizations throughout Pennsylvania had thirty-eight women Masters, 416 women Secretaries, and 508 women Lecturers. A fraternal organization open to all members of the family that permitted everyone over the age of sixteen to vote, the Grange also eased the drudgery of rural life. Grange halls became centers for country dances, suppers, and social gatherings. Local granges established junior auxiliaries and ran lecture programs that dealt with problems of the day, such as: "Can an unmarried man manage a farm as well as a married man?" and "Should Canada be annexed to the United States?" 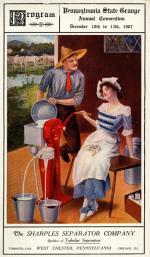 For many generations, the Grange was the most important voluntary and cooperative organization in American farm life. Although the Grange was religiously nonsectarian, it had few Catholic members, and found little support in southeast Pennsylvania, where farmers of German descent were suspicious of secret organizations. Membership peaked at 96,000 in 1922; as the number of farms in Pennsylvania dropped in the following decades, so did grange membership and influence. Today, with nearly 400 granges and 25,000 members across the state, the Pennsylvania Grange remains dedicated to improving the quality of life of farm families and communities. Headquartered in Harrisburg, this grass-roots organization continues to be a "voice for rural Pennsylvania." Fred Brenckman, History of the Pennsylvania State Grange (Harrisburg, PA: Pennsylvania State Grange), 1949. Donald B. Marti, Women of the Grange: Mutuality and Sisterhood in Rural America, 1866-1930 (New York: Greenwood Press), 1991.